Opportunity used to mean something good. As a child I was taught to seek opportunities and be thankful anytime I ever received one. Dictionary.com defines opportunity as: a good position, chance, or prospect, as for advancement or success. Well, leave it up to big corporate to change this once promising term to the complete opposite of its original meaning. When I hear the word “opportunity” said in the office, my skin crawls. Why, you ask? These politically correct, best-practice mongers had the gall to alter the word to mean weakness, or to reference an area that needs improvement. This may not be news to you but apparently I didn’t get the memo until I got a new gig that moved me from big corporate to even bigger corporate. I began to hear a familiar term being used in a perplexing context. My new coworkers would say things like, “we have some opportunity areas that we’ll need to get addressed right away.” Or, “there were a ton of opportunities on her mid-year review, I’m not sure she’ll get a decent bonus this time around.” Then it dawned on me that the word opportunity was being used as a euphemism to avoid saying something or someone needed improvement. Apparently these scaredy-cat drone bosses are too afraid to say awful words like, weakness, drawbacks, concerns, issues, limitations, difficulties and disadvantages to mature adults. For an institution (Corporate America) that has long claimed to be grounded in reality, and would often accuse the government of being superfluous, this excessive use of euphemisms seem alarmingly hypocritical to me. Nevertheless, here’s yet another example of corporate finding another way to turn neutral, often benign terms and phrases into something completely different than the original meaning. 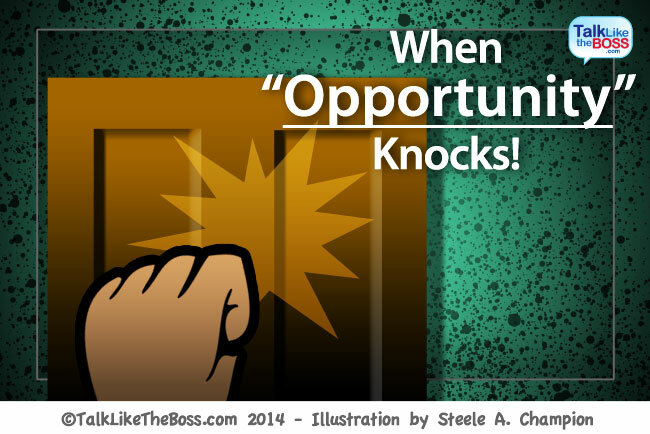 And in the case of the word “opportunity,” bosses turned it into something sinister. As children we were taught to cherish opportunities. But in corporate, when “opportunity” comes a knocking at your doorstep, don’t get excited, don’t be grateful. Be afraid (be very afraid). Because my dear fellow worker, you’ve just been told to get your crap together! I really hope that this post helped you in some way or another. And if it has, do me a favor and share this with someone or better yet, go ahead and provide your name and email address below to subscribe to TalkLikeTheBoss.com. We’ll send you more posts just like this directly to your inbox. Good comment, Steele…I have worked in Corp. America 10+ years and I don’t think I’ve heard this word used as much as I hear it now and with negative connotations no less. I think the corporate lingo will morph again once the next generation of whiz kids come onto the corporate scene. Who knows? Maybe opportunity will go back to its original meaning. Thanks for the comment Anthony! Yes this word appears to be “in” at the time. For instance, I just got out of an all-day meeting where my boss said “will there be time to correct all of the ‘opportunities’ that we uncover during testing.” I wanted to say, what’s wrong with saying defects or problems or errors? Thanks again and make sure you stay connected (via the form in the upper left) to receive more great content. My thoughts exactly Stefany. I’m glad you enjoyed the post and keep on checking back or provide your email address (via the form on the upper left) to stay connected with us. This post was a real eye-opener for me. At times the corporate jargon can be so complicated that even the crème of the crop need a translator. I too would have fallen victim of assuming that the word “opportunity” had a positive connotation. Yet the word is often camouflaged to relay an entirely different meaning then what we’re accustomed to. Colleges and Universities really need to have a Corporate 101 class. Steele, you never know, your blog could be the start of one. @RadiantGirl, thanks for stopping by again. Yes, I was completely caught off guard by the negative use of the word. And as the constant rebel, I intentionally say things like weakness, areas of improvement, short-comings and so on, just to get under my boss’ skin. It’s ridiculous that they cannot say what they mean. Again, thanks for kudos and I’d love to have this blog serve as a learning source for future workers.